In all of Vidaliana, there may be no more famous moment than the evening of Wednesday, Aug. 28, 1968. It happened at 9:39 p.m. EST, on live TV, with Gore Vidal on the Left, William F. Buckley Jr. on the Right, and the esteemed ABC newsman Howard K. Smith figuratively stuck in the middle (he was actually at an anchor desk in another room). The place: Chicago - at the Democratic National Convention. The times: a'�changi'n�. These debates have long been a part of political and literary lore. But in 2015, they came back to us: Robert Gordon and Morgan Neville co-wrote and co-directed Best of Enemies (2015), a documentary that mines the tapes of the debates and tells their story with clips and narration, and Gordon has written an introduction to the published transcripts, which were edited by Tom Graves. Vidal and Buckley had long been ideological enemies, and naturally, that made good television. In fact, before the legendary encounters in 1968, they had debated twice before: first, in September 1962, for two hours, with David Susskind as the moderator of his syndicated show Open End; and in July 1964, during the Republican convention in San Francisco, with Susskind again as moderator. So ABC invited them to conduct a series of debates at the summer�s two big political shows. The men met four times at the GOP convention in Miami, and then four more times at the Democratic show in Chicago, where Mayor Richard Daley had mobilized a massive police force to make sure protesters - bitterly angry at President Lyndon B. Johnson�s policies in Vietnam - didn�t disrupt the show. Each encounter lasted between eight and 22 minutes. 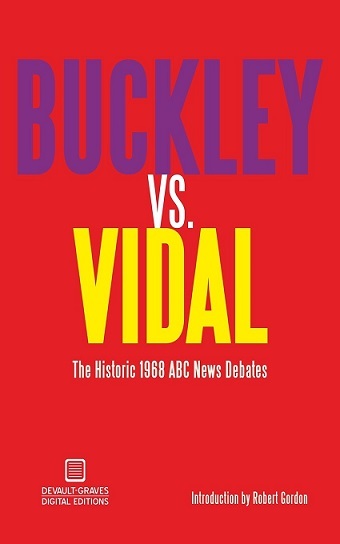 Hear the full 22-minute debate of Aug. 27, 1968, between Vidal and Buckley at the Democratic convention in Chicago. INSTRUCTIONS: If you can't play the clip directly from this page, then download the clip to your hard drive and save it as "vidal.mp3" for it to play properly. At the Aug. 28 debate in Chicago - the penultimate encounter in the series, with an estimated 10 million people watching - things began with relative calm. But it didn�t stay that way, and before long the men began exchanging words that one simply didn�t hear on TV at that time (see box below). Vidal called Buckley a "pro-crypto-Nazi," a modest slip of the tongue, he later said, because he was searching for the word "fascist" and it just didn't come out. Inflamed by the word "Nazi" and the whole tenor of the discussion, Buckley snapped back: "Now listen, you queer," he said, "stop calling me a crypto-Nazi or I�ll sock you in you goddamn face and you�ll stay plastered." Smith attempted to calm the exchange with "gentlemen, let's not call names," but the damage had been done. The two men, considerably subdued, met the following night for the last of their week of debates. Watch a one minute, 15 second clip of the exchange where Vidal calls Buckley a "crypto-Nazi" and Buckley calls Vidal a "queer." INSTRUCTIONS: If you can't play the clip directly from this page, then download the clip to your hard drive and use RealPlayer to watch it. By early 1969, Vidal said he had put the incident behind him. But Buckley had not, and so he proposed to the editors of Esquire that he write a piece about his exchanges with Vidal. Naturally, seeking fair play, the magazine asked Vidal if he would like to write about Buckley, and it was agreed that the pieces would run in consecutive issues - Buckley's in August 1969, Vidal's in September. The requisite lawsuits ensued at the time, and Vidal, who made it clear to Buckley that he would not back down, won something of a pyrrhic victory: Buckley, told by a judge that he probably would not win if his suit went to court, agreed to let Esquire pay his legal fees and issue an apology, after which he dropped his lawsuit. Vidal's legal fees went unreimbursed. But in a strange twist, the conflict resurfaced more than 30 years later when Esquire, in violation of a 1972 settlement, mistakenly republished Vidal's article in a 2003 book, Esquire's Big Book of Great Writing. The magazine had to apologize for its error, make Buckley's original essay available online for a few months, and, once again, pay a settlement to Buckley. The incident caught the attention of The Village Voice, which published a short piece about the revival of the brouhaha, and a doctoral student at Columbia University has put Vidal's essay online. A feature-length documentary film is now in the works about the debates using footage from them to recall this dramatic moment in American political history. Tom Graves, who teaches at LeMoyne-Owen College in Memphis, is the creative force behind it, and he's working with the cooperation of ABC and in collaboration with a pair of award-winning documentary filmmakers. A very interesting web site has put up some information on the debates and offers five film clips that you can play. They'll take a while to load on a dialup modem, so be patient if you want to see and hear them. The site has broken up the information on the debates into five parts: Each part is a different page, each page has a different clip, and the parts do not have convenient "next" links to take you quickly from one to another. Here, then, are the links that will take you to each page: Page 1, Page 2, Page 3, Page 4, Page 5. Scroll down each page and you'll see an image of an old-fashioned black-and-white TV console. That's where the videos will play in Quicktime (mpg) format. If you right-click on a link, you can open it in a new window. The clips are between two and five minutes long. In fact, you can even download the clips using these links: Clip 1, Clip 2, Clip 3, Clip 4, Clip 5. You'll need to right-click on each link, and then choose the appropriate "save as" command from your menu. The clips will play only through Quicktime player. I've received many queries over the years about where to find full-length videotapes of those famous encounters from that hazy ancient summer. There is a source, but getting all of the tapes could be rather expensive. Vanderbilt University has an enormous archive of taped television news broadcasts going back to the early days of television, and the Vidal/Buckley encounters are among them. When you arrive at the site, click the "Enter TV-NewsSearch" button in the text to register an account in your name. Then, using the search engine, enter "Gore Vidal." Many programs will come up, including some that list Vidal and Buckley as "reporters." Finally, if you came directly to this page, please visit The Gore Vidal Index.